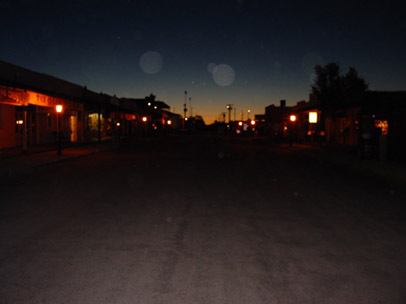 We'll it's happened again, this time I captured some kind of orbs on Allen Street in Tombstone during Clanton Day's 2001. Here's the details: Before leaving for Tombstone last week I purchased a new Sony digital camera. On Friday morning November 16th I got up early in the morning to go for my everyday 2 1/2 mile walk. 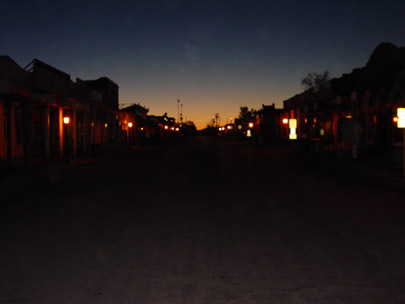 I decided to take my new camera with me to take a few photos of the sun coming up in Tombstone. I figured I would take a few photos and delete the ones I didn't like later. 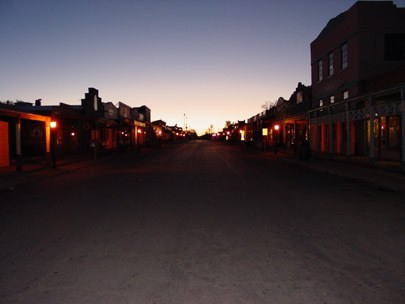 All of the photos below were taken at different locations on Allen Street in Tombstone, November 16, 2001, between 6:16 am and 6:25 am. Nobody was around, not a soul in sight when I started snapping these photos. I did not touch the camera lens, nor was their anything on it, as you can clearly see the orbs completely disappear by 6:25 a.m. Because this was shot with a digital camera, we can now throw out that the orbs were created by some type of chemical being dropped on the picture while they were being processing, as others have suggested about other photos. The skeletons face we witnessed in one of the orbs while zooming in on one of the orbs while re-sizing the photo is down right spooky. View the following photos and come to your own conclusion, but once again, these photos were NOT staged with some type of photo shop process. Many people that attended our 8th annual Clanton Day's event, viewed the orbs on photos on the little viewer on the back of the digital camera before we brought them home and downloaded them. I use to be the number one skeptic on ghosts, but my trips to Tombstone over the years have certainly changed my mind. 6:16 am - This was the first photo I took, wow! orbs are everywhere! we could clearly see a skeletons face that's down right spooky in one of the orbs. 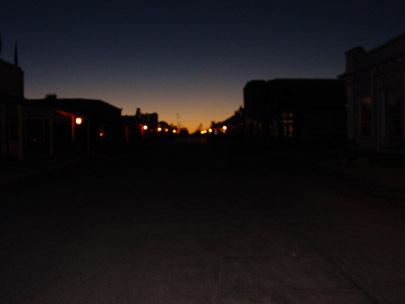 6:25 am - No orbs were visible, even after enlarging the photo.